Greater adjutant have so far not been reliably recorded in Cambodia's Eastern Plains Landscape, but globally significant population exist around Cambodia's Tonle Sap lake and in northern Cambodia. Greater adjutants are large and distinctive storks that use tropical wetlands to feed on small aquatic and terrestrial wildlife. Like their African cousin, the marabou stork, greater adjutants will also eat carrion and are known to scavenge at human refuse and carcass dumps. 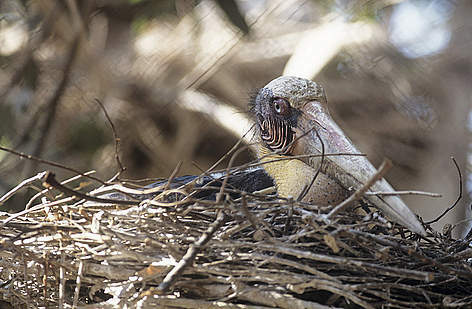 Probably due to direct exploitation, particularly at nesting colonies, as well as habitat destruction and over-exploitation of wetlands, the species has undergone a massive decline in the first half of the 20th century. The Cambodian population is estimated to number 150-200 birds. Besides the species’ stronghold in northeast India, Cambodia is the only place in the world where greater adjutants still breed. While two thirds of the Cambodian population congregate in the Tonle Sap Biosphere Reserve, a few tens of pairs also persist in areas of dry forest in the northern plains as well as possibly along the Mekong mainstream north of Kratie. Strict protection of nesting sites and enforcement of waterbird conservation legislation is needed to protect this species from threats of chick and egg collection and other forms of disturbance. Closely related but somewhat more common, the lesser adjutant (Leptoptilos javanicus) also inhabits Cambodian wetlands around the Tonle Sap and in the northern and eastern dry forests. 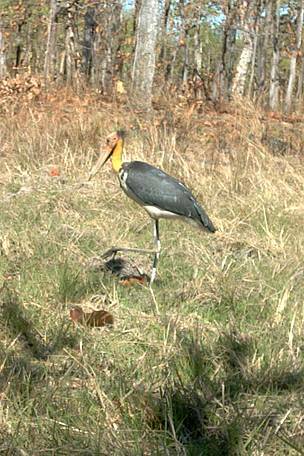 In Mondulkiri Protected Forest within the Eastern Plains Landscape, lesser adjutants are regularly observed in the forest’s many trapeang (watering holes), but small numbers of greater adjutant may also be present in the area. The globally threatened lesser adjutant is regularly observed at the many waterholes of Cambodia's Eastern Plains Landscape.